189:0.3 When they heard the Personalized Adjuster so speak, they all assumed the attitude of anxious expectancy, from Gabriel down to the most humble cherubim. They saw the mortal body of Jesus in the tomb; they detected evidences of the universe activity of their beloved Sovereign; and not understanding such phenomena, they waited patiently for developments. 189:1.1 At two forty-five Sunday morning, the Paradise incarnation commission, consisting of seven unidentified Paradise personalities, arrived on the scene and immediately deployed themselves about the tomb. 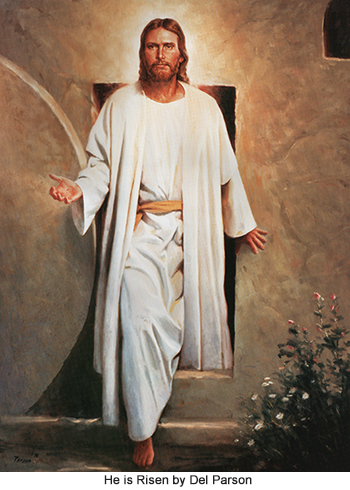 At ten minutes before three, intense vibrations of commingled material and morontia activities began to issue from Joseph’s new tomb, and at two minutes past three o’clock, this Sunday morning, April 9, A.D. 30, the resurrected morontia form and personality of Jesus of Nazareth came forth from the tomb. 189:1.2 After the resurrected Jesus emerged from his burial tomb, the body of flesh in which he had lived and wrought on earth for almost thirty-six years was still lying there in the sepulchre niche, undisturbed and wrapped in the linen sheet, just as it had been laid to rest by Joseph and his associates on Friday afternoon. Neither was the stone before the entrance of the tomb in any way disturbed; the seal of Pilate was still unbroken; the soldiers were still on guard. The temple guards had been on continuous duty; the Roman guard had been changed at midnight. None of these watchers suspected that the object of their vigil had risen to a new and higher form of existence, and that the body which they were guarding was now a discarded outer covering which had no further connection with the delivered and resurrected morontia personality of Jesus. 189:1.3 Mankind is slow to perceive that, in all that is personal, matter is the skeleton of morontia, and that both are the reflected shadow of enduring spirit reality. How long before you will regard time as the moving image of eternity and space as the fleeting shadow of Paradise realities? 189:1.4 As far as we can judge, no creature of this universe nor any personality from another universe had anything to do with this morontia resurrection of Jesus of Nazareth. On Friday he laid down his life as a mortal of the realm; on Sunday morning he took it up again as a morontia being of the system of Satania in Norlatiadek. There is much about the resurrection of Jesus which we do not understand. But we know that it occurred as we have stated and at about the time indicated. We can also record that all known phenomena associated with this mortal transit, or morontia resurrection, occurred right there in Joseph’s new tomb, where the mortal material remains of Jesus lay wrapped in burial cloths. 189:1.5 We know that no creature of the local universe participated in this morontia awakening. We perceived the seven personalities of Paradise surround the tomb, but we did not see them do anything in connection with the Master’s awakening. Just as soon as Jesus appeared beside Gabriel, just above the tomb, the seven personalities from Paradise signalized their intention of immediate departure for Uversa. 1. His material or physical body was not a part of the resurrected personality. When Jesus came forth from the tomb, his body of flesh remained undisturbed in the sepulchre. He emerged from the burial tomb without moving the stones before the entrance and without disturbing the seals of Pilate. 2. 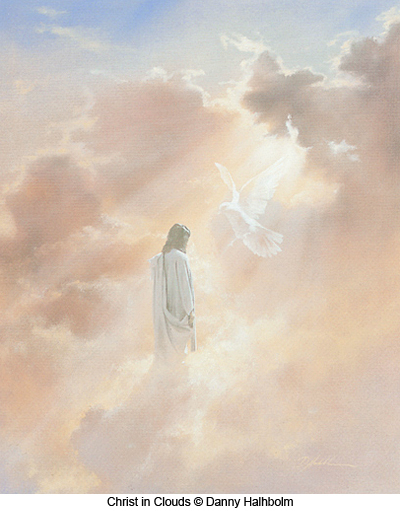 He did not emerge from the tomb as a spirit nor as Michael of Nebadon; he did not appear in the form of the Creator Sovereign, such as he had had before his incarnation in the likeness of mortal flesh on Urantia. 3. He did come forth from this tomb of Joseph in the very likeness of the morontia personalities of those who, as resurrected morontia ascendant beings, emerge from the resurrection halls of the first mansion world of this local system of Satania. And the presence of the Michael memorial in the center of the vast court of the resurrection halls of mansonia number one leads us to conjecture that the Master’s resurrection on Urantia was in some way fostered on this, the first of the system mansion worlds. 189:1.11 After Jesus had spoken, he signaled to the Personalized Adjuster, and all universe intelligences who had been assembled on Urantia to witness the resurrection were immediately dispatched to their respective universe assignments. 189:1.12 Jesus now began the contacts of the morontia level, being introduced, as a creature, to the requirements of the life he had chosen to live for a short time on Urantia. 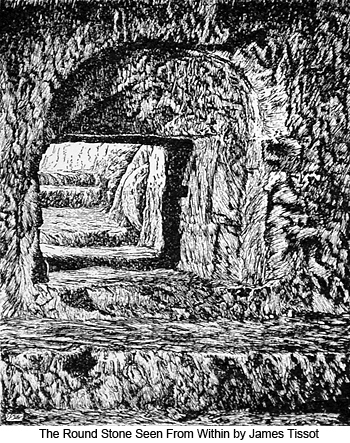 This initiation into the morontia world required more than an hour of earth time and was twice interrupted by his desire to communicate with his former associates in the flesh as they came out from Jerusalem wonderingly to peer into the empty tomb to discover what they considered evidence of his resurrection. 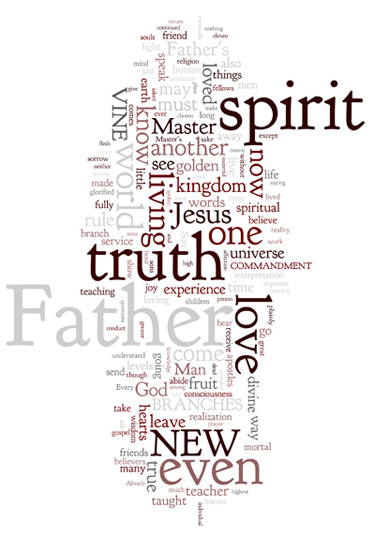 189:1.13 Now is the mortal transit of Jesus—the morontia resurrection of the Son of Man—completed. The transitory experience of the Master as a personality midway between the material and the spiritual has begun. And he has done all this through power inherent within himself; no personality has rendered him any assistance. He now lives as Jesus of morontia, and as he begins this morontia life, the material body of his flesh lies there undisturbed in the tomb. The soldiers are still on guard, and the seal of the governor about the rocks has not yet been broken. 189:2.2 And when Gabriel had conferred with the senior Most High of Edentia, the archangel spokesman for the celestial hosts was given permission to make such disposition of the physical remains of Jesus as he might determine. 189:2.3 After the chief of archangels had been granted this request, he summoned to his assistance many of his fellows, together with a numerous host of the representatives of all orders of celestial personalities, and then, with the aid of the Urantia midwayers, proceeded to take possession of Jesus’ physical body. This body of death was a purely material creation; it was physical and literal; it could not be removed from the tomb as the morontia form of the resurrection had been able to escape the sealed sepulchre. By the aid of certain morontia auxiliary personalities, the morontia form can be made at one time as of the spirit so that it can become indifferent to ordinary matter, while at another time it can become discernible and contactable to material beings, such as the mortals of the realm. 189:2.4 As they made ready to remove the body of Jesus from the tomb preparatory to according it the dignified and reverent disposal of near-instantaneous dissolution, it was assigned the secondary Urantia midwayers to roll away the stones from the entrance of the tomb. The larger of these two stones was a huge circular affair, much like a millstone, and it moved in a groove chiseled out of the rock, so that it could be rolled back and forth to open or close the tomb. When the watching Jewish guards and the Roman soldiers, in the dim light of the morning, saw this huge stone begin to roll away from the entrance of the tomb, apparently of its own accord—without any visible means to account for such motion—they were seized with fear and panic, and they fled in haste from the scene. The Jews fled to their homes, afterward going back to report these doings to their captain at the temple. The Romans fled to the fortress of Antonia and reported what they had seen to the centurion as soon as he arrived on duty. 189:2.5 The Jewish leaders began the sordid business of supposedly getting rid of Jesus by offering bribes to the traitorous Judas, and now, when confronted with this embarrassing situation, instead of thinking of punishing the guards who deserted their post, they resorted to bribing these guards and the Roman soldiers. They paid each of these twenty men a sum of money and instructed them to say to all: “While we slept during the nighttime, his disciples came upon us and took away the body.” And the Jewish leaders made solemn promises to the soldiers to defend them before Pilate in case it should ever come to the governor’s knowledge that they had accepted a bribe. 189:2.6 The Christian belief in the resurrection of Jesus has been based on the fact of the “empty tomb.” It was indeed a fact that the tomb was empty, but this is not the truth of the resurrection. The tomb was truly empty when the first believers arrived, and this fact, associated with that of the undoubted resurrection of the Master, led to the formulation of a belief which was not true: the teaching that the material and mortal body of Jesus was raised from the grave. Truth having to do with spiritual realities and eternal values cannot always be built up by a combination of apparent facts. Although individual facts may be materially true, it does not follow that the association of a group of facts must necessarily lead to truthful spiritual conclusions. 189:2.7 The tomb of Joseph was empty, not because the body of Jesus had been rehabilitated or resurrected, but because the celestial hosts had been granted their request to afford it a special and unique dissolution, a return of the “dust to dust,” without the intervention of the delays of time and without the operation of the ordinary and visible processes of mortal decay and material corruption. 189:2.8 The mortal remains of Jesus underwent the same natural process of elemental disintegration as characterizes all human bodies on earth except that, in point of time, this natural mode of dissolution was greatly accelerated, hastened to that point where it became well-nigh instantaneous. 189:2.9 The true evidences of the resurrection of Michael are spiritual in nature, albeit this teaching is corroborated by the testimony of many mortals of the realm who met, recognized, and communed with the resurrected morontia Master. He became a part of the personal experience of almost one thousand human beings before he finally took leave of Urantia. 189:3.2 The circuit of the archangels then operated for the first time from Urantia. Gabriel and the archangel hosts moved to the place of the spiritual polarity of the planet; and when Gabriel gave the signal, there flashed to the first of the system mansion worlds the voice of Gabriel, saying: “By the mandate of Michael, let the dead of a Urantia dispensation rise!” Then all the survivors of the human races of Urantia who had fallen asleep since the days of Adam, and who had not already gone on to judgment, appeared in the resurrection halls of mansonia in readiness for morontia investiture. And in an instant of time the seraphim and their associates made ready to depart for the mansion worlds. Ordinarily these seraphic guardians, onetime assigned to the group custody of these surviving mortals, would have been present at the moment of their awaking in the resurrection halls of mansonia, but they were on this world itself at this time because of the necessity of Gabriel’s presence here in connection with the morontia resurrection of Jesus. 189:3.3 Notwithstanding that countless individuals having personal seraphic guardians and those achieving the requisite attainment of spiritual personality progress had gone on to mansonia during the ages subsequent to the times of Adam and Eve, and though there had been many special and millennial resurrections of Urantia sons, this was the third of the planetary roll calls, or complete dispensational resurrections. The first occurred at the time of the arrival of the Planetary Prince, the second during the time of Adam, and this, the third, signalized the morontia resurrection, the mortal transit, of Jesus of Nazareth. 189:3.4 When the signal of the planetary resurrection had been received by the chief of archangels, the Personalized Adjuster of the Son of Man relinquished his authority over the celestial hosts assembled on Urantia, turning all these sons of the local universe back to the jurisdiction of their respective commanders. And when he had done this, he departed for Salvington to register with Immanuel the completion of the mortal transit of Michael. And he was immediately followed by all the celestial host not required for duty on Urantia. But Gabriel remained on Urantia with the morontia Jesus. 189:3.5 And this is the recital of the events of the resurrection of Jesus as viewed by those who saw them as they really occurred, free from the limitations of partial and restricted human vision. 189:4.1 As we approach the time of the resurrection of Jesus on this early Sunday morning, it should be recalled that the ten apostles were sojourning at the home of Elijah and Mary Mark, where they were asleep in the upper chamber, resting on the very couches whereon they reclined during the last supper with their Master. This Sunday morning they were all there assembled except Thomas. Thomas was with them for a few minutes late Saturday night when they first got together, but the sight of the apostles, coupled with the thought of what had happened to Jesus, was too much for him. He looked his associates over and immediately left the room, going to the home of Simon in Bethpage, where he thought to grieve over his troubles in solitude. The apostles all suffered, not so much from doubt and despair as from fear, grief, and shame. 189:4.2 At the home of Nicodemus there were gathered together, with David Zebedee and Joseph of Arimathea, some twelve or fifteen of the more prominent of the Jerusalem disciples of Jesus. At the home of Joseph of Arimathea there were some fifteen or twenty of the leading women believers. Only these women abode in Joseph’s house, and they had kept close within during the hours of the Sabbath day and the evening after the Sabbath, so that they were ignorant of the military guard on watch at the tomb; neither did they know that a second stone had been rolled in front of the tomb, and that both of these stones had been placed under the seal of Pilate. 189:4.3 A little before three o’clock this Sunday morning, when the first signs of day began to appear in the east, five of the women started out for the tomb of Jesus. They had prepared an abundance of special embalming lotions, and they carried many linen bandages with them. It was their purpose more thoroughly to give the body of Jesus its death anointing and more carefully to wrap it up with the new bandages. 189:4.4 The women who went on this mission of anointing Jesus’ body were: Mary Magdalene, Mary the mother of the Alpheus twins, Salome the mother of the Zebedee brothers, Joanna the wife of Chuza, and Susanna the daughter of Ezra of Alexandria. 189:4.5 It was about half past three o’clock when the five women, laden with their ointments, arrived before the empty tomb. As they passed out of the Damascus gate, they encountered a number of soldiers fleeing into the city more or less panic-stricken, and this caused them to pause for a few minutes; but when nothing more developed, they resumed their journey. 189:4.6 They were greatly surprised to see the stone rolled away from the entrance to the tomb, inasmuch as they had said among themselves on the way out, “Who will help us roll away the stone?” They set down their burdens and began to look upon one another in fear and with great amazement. While they stood there, atremble with fear, Mary Magdalene ventured around the smaller stone and dared to enter the open sepulchre. This tomb of Joseph was in his garden on the hillside on the eastern side of the road, and it also faced toward the east. By this hour there was just enough of the dawn of a new day to enable Mary to look back to the place where the Master’s body had lain and to discern that it was gone. In the recess of stone where they had laid Jesus, Mary saw only the folded napkin where his head had rested and the bandages wherewith he had been wrapped lying intact and as they had rested on the stone before the celestial hosts removed the body. The covering sheet lay at the foot of the burial niche. 189:4.7 After Mary had tarried in the doorway of the tomb for a few moments (she did not see distinctly when she first entered the tomb), she saw that Jesus’ body was gone and in its place only these grave cloths, and she uttered a cry of alarm and anguish. All the women were exceedingly nervous; they had been on edge ever since meeting the panicky soldiers at the city gate, and when Mary uttered this scream of anguish, they were terror-stricken and fled in great haste. And they did not stop until they had run all the way to the Damascus gate. By this time Joanna was conscience-stricken that they had deserted Mary; she rallied her companions, and they started back for the tomb. 189:4.8 As they drew near the sepulchre, the frightened Magdalene, who was even more terrorized when she failed to find her sisters waiting when she came out of the tomb, now rushed up to them, excitedly exclaiming: “He is not there—they have taken him away!” And she led them back to the tomb, and they all entered and saw that it was empty. 189:4.9 All five of the women then sat down on the stone near the entrance and talked over the situation. It had not yet occurred to them that Jesus had been resurrected. They had been by themselves over the Sabbath, and they conjectured that the body had been moved to another resting place. But when they pondered such a solution of their dilemma, they were at a loss to account for the orderly arrangement of the grave cloths; how could the body have been removed since the very bandages in which it was wrapped were left in position and apparently intact on the burial shelf? 189:4.10 As these women sat there in the early hours of the dawn of this new day, they looked to one side and observed a silent and motionless stranger. For a moment they were again frightened, but Mary Magdalene, rushing toward him and addressing him as if she thought he might be the caretaker of the garden, said, “Where have you taken the Master? Where have they laid him? Tell us that we may go and get him.” When the stranger did not answer Mary, she began to weep. Then spoke Jesus to them, saying, “Whom do you seek?” Mary said: “We seek for Jesus who was laid to rest in Joseph’s tomb, but he is gone. Do you know where they have taken him?” Then said Jesus: “Did not this Jesus tell you, even in Galilee, that he would die, but that he would rise again?” These words startled the women, but the Master was so changed that they did not yet recognize him with his back turned to the dim light. And as they pondered his words, he addressed the Magdalene with a familiar voice, saying, “Mary.” And when she heard that word of well-known sympathy and affectionate greeting, she knew it was the voice of the Master, and she rushed to kneel at his feet while she exclaimed, “My Lord, and my Master!” And all of the other women recognized that it was the Master who stood before them in glorified form, and they quickly knelt before him. 189:4.11 These human eyes were enabled to see the morontia form of Jesus because of the special ministry of the transformers and the midwayers in association with certain of the morontia personalities then accompanying Jesus. 189:4.13 After these women had recovered from the shock of their amazement, they hastened back to the city and to the home of Elijah Mark, where they related to the ten apostles all that had happened to them; but the apostles were not inclined to believe them. 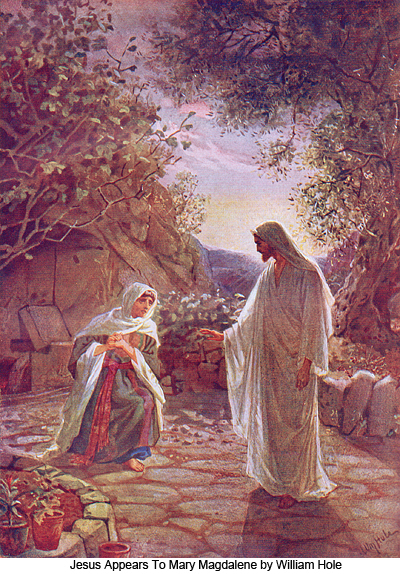 They thought at first that the women had seen a vision, but when Mary Magdalene repeated the words which Jesus had spoken to them, and when Peter heard his name, he rushed out of the upper chamber, followed closely by John, in great haste to reach the tomb and see these things for himself. 189:4.14 The women repeated the story of talking with Jesus to the other apostles, but they would not believe; and they would not go to find out for themselves as had Peter and John. 189:5.1 As the two apostles raced for Golgotha and the tomb of Joseph, Peter’s thoughts alternated between fear and hope; he feared to meet the Master, but his hope was aroused by the story that Jesus had sent special word to him. He was half persuaded that Jesus was really alive; he recalled the promise to rise on the third day. Strange to relate, this promise had not occurred to him since the crucifixion until this moment as he hurried north through Jerusalem. As John hastened out of the city, a strange ecstasy of joy and hope welled up in his soul. He was half convinced that the women really had seen the risen Master. 189:5.2 John, being younger than Peter, outran him and arrived first at the tomb. John tarried at the door, viewing the tomb, and it was just as Mary had described it. 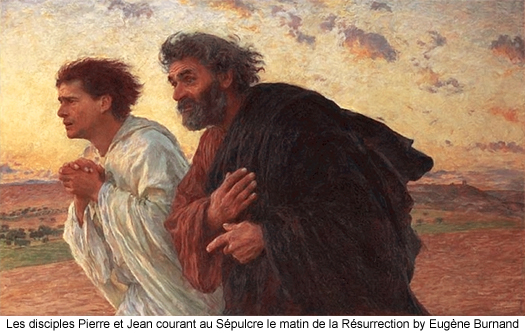 Very soon Simon Peter rushed up and, entering, saw the same empty tomb with the grave cloths so peculiarly arranged. And when Peter had come out, John also went in and saw it all for himself, and then they sat down on the stone to ponder the meaning of what they had seen and heard. And while they sat there, they turned over in their minds all that had been told them about Jesus, but they could not clearly perceive what had happened. 189:5.3 Peter at first suggested that the grave had been rifled, that enemies had stolen the body, perhaps bribed the guards. But John reasoned that the grave would hardly have been left so orderly if the body had been stolen, and he also raised the question as to how the bandages happened to be left behind, and so apparently intact. And again they both went back into the tomb more closely to examine the grave cloths. 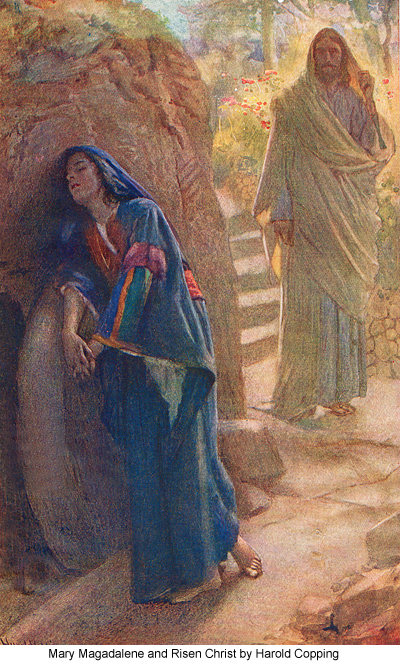 As they came out of the tomb the second time, they found Mary Magdalene returned and weeping before the entrance. Mary had gone to the apostles believing that Jesus had risen from the grave, but when they all refused to believe her report, she became downcast and despairing. She longed to go back near the tomb, where she thought she had heard the familiar voice of Jesus. 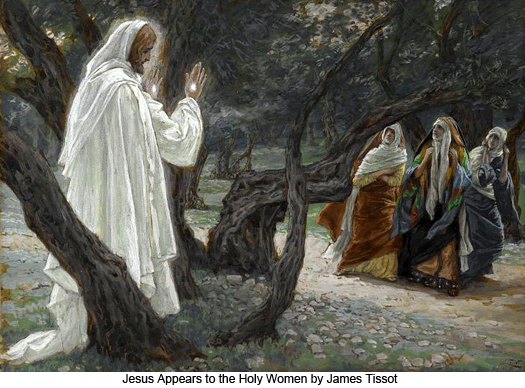 189:5.5 Mary hurried back to the Mark home and told the apostles she had again talked with Jesus, but they would not believe her. But when Peter and John returned, they ceased to ridicule and became filled with fear and apprehension.